Offer them a bowl of Salad or soup and “Yuckhh” comes the tongue out of their mouths. Kids take seconds to completely reject even the yummiest of recipes that have taken you hours to prepare. On the other hand, give them a big bowl of pasta or noodles, and the bowl is wiped clean! 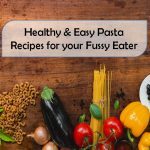 So why not use their favorite Pasta to make easy pasta recipes, with a twist of health & ease to give them the best of both worlds?? Win-win situation I’d say!! I would love to thank Dr. Oetker FunFoods to share their products and the most amazing of recipes that helped me build upon them. The original recipes are by the in-house chef at Dr. Oetker FunFoods. One of the most easy pasta recipes consists off wonder foods like the spinach which give a dull green colour to the pasta. While the colour helps to distract the child from its ingredients, the spinach, cheese, and other lovely vegetables pack wholesome nutrition into your child’s favorite dish. Heat oil in a pan and add garlic and onion to it. cook for about 30 seconds or until onion gets slightly brown. Add the chopped tomatoes and cook for 1-2 minutes until the pieces get soft. Add mushroom and spinach and sauté for 2-3 minutes. Both of these veggies will give out water, so you need to cook it till the water evaporates. Season it with a pinch of salt and pepper. Now take this entire mix and blend completely with a blender to make a paste. Add pasta stock to above vegetables and stir. Take the pan away from the flame, add mayonnaise and the grated cheese, and stir well. Then put it back on flame and let it cook on very low flame for 2-3 minutes or until the gravy dries up to a consistency you like. Add your boiled paste to above sauce and toss well. Serve hot. P.S. You may choose to keep the veggies as is, instead of pureeing them, if you prefer that way. Skipping out the pureeing step makes it one of the easy pasta recipes. Another one of the quick & easy pasta recipes is somewhat pink in colour because of the redness of the sauces and the dilution with milk. This recipe is rich in nutrients as you have the option to add half a cup of veggies of your choice, so they don’t alter the flavor or colour of the preparation too much, yet bring nutrition. In a pressure cooker add the veggies of choice with some salt, and cook them till they are very soft. Drain the excess water and run them through a blender to make a smooth paste. You may strain it to get a very smooth and velvety texture. In a non-stick pan add 1/2 a jar of the pasta alfredo sauce, full cream milk, pasta and pizza sauce and the veggie puree. Heat this mix on low flame stirring continuously to reach a consistency of choice. Finally add the boiled penne, toss and serve hot. It is really li child’s favorite dish.onvenient to stock ready sauces and dips from Dr. Oetker FunFoods as it makes tiffin time & snack time a quick and easy affair. Adding pureed veggies enhances the colour quotient & the nutrient value, bringing you the relief that you are serving the right things to your kids. If you liked this article, SHARE it with your Mom friends who love to experiment with food for their little ones. You may also like to read Festive Indo-western Fusion recipes.